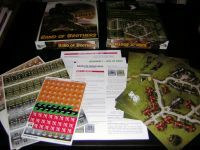 Band of Brothers is the latest squad-level tactical game system to appear in what is an increasingly crowded market. I've owned or played just about everything except ATS, and I ended up whittling down my collection to just two games, Combat Commander and Conflict of Heroes, which manage to provide very different feels while covering similar ground. Now along comes Band of Brothers, which offers a distinctly different take on the subject matter. Should someone who is locked into one of those other systems open up their wallets and add room in their collection for the new kid on the block? The short answer is yes. The long answer...that's below. Remember that this is primarily a review of BoB, but I will make frequent references to the other games. The newest bunch of tactical games are generally very nice to look at, and for the most part, BoB is no exception. The map boards are modular and double sided, and the artwork on them is very interesting, as Worthington has gone for a stylized look rather than opting for photo realism. They can't compare to the luxurious boards you get with Conflict of Heroes, but they are certainly nicer to look at and more evocative than your typical Combat Commander board. Scale is 40 meters to a hex, identical to CoH and 10 meters larger than CC. It should be noted that the maps are rather small, which can make them feel constricted as far as maneuver is concerned. This is apparently a design decision, as the author's research suggested that actions on this level generally took place on very narrow frontages. The counters are glossy and big, and all relevant information is easily accessible. I happen to not like the counter art, but that's a personal issue. One more functional concern is that many of the counters are double-sided, and due to a relatively small total number of counters, you have to spend a lot of time scrounging an information marker or a dummy marker you need from this or that group of counters. This is a particularly confusing situation because the game shipped with 1/2 a counter sheet of blank counters. Anyway, Conflict of Heroes remains best in class here by a healthy margin, but I think BoB is very comfortably in the second tier; it's certainly no worse looking than Combat Commander or Band of Heroes, and in some respects, it's quite a bit better looking. There are two primary mechanisms for asserting command and control in CC. The first is the use of leader counters, and the second is the use of order cards. Leaders allow you to activate more than one unit at a time by throwing out a command radius of either 1 or 2, and order cards (along with the action cards) dictate what those units can do once they have been activated. The mechanisms here are a clear grafting of the Up Front card mechanic onto a Squad Leader chassis. It's not so much a fresh look at how combat worked as an attempt to put two great tastes together in the hopes of something tasting twice as good. I've got two big picks with this approach. The first is the leader counters--while they have become a standard trope in tactical games, I think they distort how combat works at this level (all squads have inherent leadership that is much more relevant to how they perform), and they create unnecessary rules overhead. As for the order system, it's fun to use, but I think it doesn't accurately model how friction works on the battlefield at all. The chaos model is flat--a unit is just as unlikely to be able to move down a road on the first turn of the game as they are later on when they have become embroiled in a firefight. That doesn't jive with my reading on the subject. Instead, units should be fairly maneuverable before contact, but should be difficult to move once they are under fire, in part because they are totally absorbed with the threat to their front and are shooting back. It should be hard to get them to switch targets, but not to fire in the first place. That's not what happens in CC. Also, combat resolution is fairly binary, as units are either in good order or broken, with each state clearly defining how much control you have over the unit afterwards. Conflict of Heroes removes leaders and replaces them with a generic pool of command points, that can be used anywhere on the battlefield so long as you have them. These command points go down as you take casualties, simulating the loss of command and control; in effect, your units lose flexibility and capacity as they take losses. Each unit has a certain pool of action points, which allows them to mix movement and fire, and activations are semi-simultaneous, which is to say that you will have back and forth impulses where you have one unit activated and the opponent has one unit activated, though from time to time you will interrupt with other unit actions through the use of command points or cards. It's a fun system that almost eliminates downtime, but it has the potential to make the combat look like individual dogfights between squads rather than large scale encounters between platoon or company elements. Your control of your forces is pretty absolute, as well, as you have the option of moving every squad on every turn. (Though it is rarely wise to do so.) What I like about the combination of CAPs and activations is that the system elegantly encourages you to keep a reserve, both of forces and of energy. If players don't play smart, however, things can degenerate into gaminess, as the opposing player walks up to your used squads and blasts away imperviously from short range. Units that take damage from fire are affected in various ways, which adds some randomness to your control over them. Band of Brothers uses alternating Operations Phases to determine movement. You have scenario defined limits for the minimum and maximum number of troops you can move before the opponent gets a turn. There are no leaders here, either, and squads have a simple choice of three possible actions when they are activated--they can move, they can shoot, or they can prep for Op Fire, which makes them marginally more effective when shooting at a moving target (prepping for Op Fire effectively can double as a pass function, when you don't want to move a unit). In theory you have full control of your forces, but units that have been shot at and suffered suppression have to pass either a morale or proficiency test before they can conduct an action. If they fail the roll, they are used just as if they had completed the action, and it counts against your operations limit. This is an elegant system that works much better in practice than either of the others. Units that have not engaged in combat are responsive, but their responsiveness deteriorates the longer they are exposed to fire. Units that are fully suppressed are unable to do much of anything other than possibly retreat. With an absolute minimum of rules overhead, BoB captures the way combat creates friction and degrades C3I better than any other game I've played to date. 2) How does the damage model encourage realistic tactics? Combat Commander imports the binary good order/broken mechanic of SL. In fact, it takes it a step further, as it is impossible to actually eliminate a unit through fire. Whether shot at by a weapons team from long range, or sitting smack in the middle of a massive artillery bombardment in the open, the result can only be the same--a squad will either break or it won't. The only way to actually eliminate units in one go is to enter melee, which is a highly unpredictable environment. Units in cover are extremely difficult to kill with ranged fire, which is how it should be. The model does encourage large fire groups targeting broken troops in order to generate casualties, which is not as accurate, as troops should be encouraged to spread their fire more evenly. Range is not a major issue--unless you have a hand grenade card, fire is just as effective at 160 meters as it is at 40 meters. You will generally need to close and assault if you want to root out a high morale squad in a building or other good terrain. I appreciate the fact that units sometimes can't fire--infantry leaders can certainly attest to times when their units did not fire despite having every reason to, and I don't think that combat should be automatic under all circumstances. However, the damage model doesn't really encourage you to find, fix, flank and finish your opponent. Conflict of Heroes is the first squad level game to give its infantry units front and flank arcs, which I think is generally a good idea. Yes, units can cover all directions much better than, say, a turreted vehicle could. That said, infantry units clear have areas of attention and focus dictated by their deployment, and the literature is full of accounts of units reacting badly when they received fire coming from their flank or rear. CoH has a damage model that is somewhat similar to CC--again, it generally requires two shots to kill a good order unit--but combat is potentially more deadly, as any shot that exceeds the defense factor by 4 or more will eliminate the target in one shot. Also, there is one elimination damage chit, which can again polish off an unlucky unit that draws it. The damage inflicted by firing is both hidden and random. A unit might be pinned and unable to move, or they might be suppressed and unable to fire effectively, or they might be totally incapacitated. It's a nice effect, however it is partially undone by the fact that any unit that is hit once is going to draw more fire in an attempt to secure an elimination. So again, there is a strong emphasis on blasting away at units that have already been rendered combat ineffective in an attempt to create casualties, rather than spreading fire out evenly to suppress the enemy's troops. There is a +4 award for firing in close combat and a +3 modifier for firing from an adjacent hex, which does encourage units to close to close range in order to eliminate an opponent. That said, it is often easier to simply add +2 to a MG firing from range. Band of Brothers registers damage in two ways--through casualty reductions and through suppression. It is relatively easy to suppress a unit, but it is difficult to generate casualties at distance. Suppression wears off over time, which means that you need to keep firing at defenders if you want them to keep their heads down. Once a unit is fully suppressed, however, there is little reason to keep shooting at it, as the odds of generating casualties with anything other than artillery or an HMG are pretty remote. Closing on a non-suppressed unit is very dangerous, as there is a -3 modifier for adjacency and a -4 modifier for moving in the open, meaning that any squad that gets caught out with Op Fire is almost guaranteed to take casualties. Melee rules are interesting in that you will often never make it to melee at all thanks to the rout rules. Suffice to say that there is very strong incentive to pin down enemy squads with fire, then advance to finish them off at short range. It's possible that this dynamic is too pronounced, too stilted in favor of fire and movement over massed fires, to the point where it resembles doctrine more than actual field practice; I've only had the game for a few days and am still experimenting with defensive counters to this approach. Still, this game gives you more of a rewards for using the find/fix/flank (OK, not flank) and finish dictum than the other games. 3) How does the game create fog of war? Combat Commander is open information in the sense that you can always see every unit on the map. Instead, you don't know what their ability to act is like. This requires an extra step of visualizing--if you have no fire card to use when an enemy moves by you, one possible interpretation is that your squad never saw him at all. Where CC is really strong is in bringing other uncertainty to bear on the engagement. The length of the scenario is variable, the objectives for each side are variable and often hidden, and the possibility of random reinforcements make the Scenario OOB something less than fixed. Conflict of Heroes has a simple set of hidden unit rules that can be really effective. When you as an attacker encounter an empty board with all the defenders hidden, it definitely gives you the appropriate sense of hesitation and uncertainty. (It would be even better if you didn't have access to the Scenario OOB, of course.) Rules allow units to go hidden by spending 7 APs when out of LOS. The downside to the hidden units rules are that they require some paperwork to keep track of and that they hinder solitaire play. For solitaire, my recommended fix is to place two pennies on the board for every hidden unit and to keep the units in a coffee cup, along with an equal number of informational markers. Draw from the cup when it is time to reveal and randomly discover what unit was represented, or if it was a dummy. Band of Brothers goes in a different direction from CoH; instead of removing units via hidden rules, it floods the board with decoys. 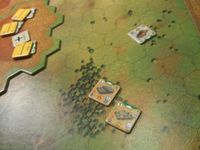 Most units begin the game concealed, which simply requires being deployed in terrain with a modifier, and the defender gets multiple decoys to mix in. It's not a perfect solution by any means, but it does create something of the necessary uncertainty, and the benefits of being concealed are such that both players will frequently be maneuvering to get their squads under those decoy/conceal counters. This would seem to be a serious problem for solitaire players, but I find that randomly mixing the decoy and squad counters around and then deploying them as if they were all real squads provides a surprisingly satisfying experience and works as a realistic brake on the attacker's tempo. Conclusion: I think that Band of Brothers is really an impressive achievement. Despite a ruleset that is extremely streamlined--the game is easier than either CoH or CC, both of which are not terribly difficult--the result is something that captures its subject matter in what I can only describe as a more authentic way. If I was to put my finger on why that is, it has to do with design philosophy. Instead of looking at earlier games as touchstones for how to proceed, the designer clearly looked at tactical combat first, made some observations about how it worked, and then considered how to translate that into game mechanics. All the fat has been ruthlessly shaved off the design, and in some ways, I think that will bother people. There are simply fewer decisions to be made in a game of Band of Brothers than there are in CC or CoH (nevermind ASL), but the thing is, those decisions are the right decisions. People who enjoy tactical games absolutely owe it to themselves to check this one out. Thanks for the review Sean! Thanks for the review. The game is on my wish list. Secret Santa's take note! Fantastic review. I have played both CoH and CC as well. I concur fully with your assessment of the distinctions and strengths of BoB. This is a very thoughtful design. hmm wow thanks for that comparison. I wanted to get a better war game as i saw M44 and TOI was more of dice fest over strategy. Not sure if i would enjoy wargame board games though. Not sure if they offer the level of strategy i expect or need but I sure as hell want to try. A very insightful and thoughtful review. Thank you. Thanks for taking the time to do such an interesting and in depth review - appreciated. Fantastic review - you point out the primary reasons that I will definitely buy this game, and hope to play it soon. Thank you for the Interview! I think this is the game for me. I'm on the fence on this one, not because I don't think I'll like the game (I already know I will) but I have so many fantastic unplayed games awaiting their turn that I don't want to add to the pile. Thanks for the review. Hoping to see BoB in Europe soon. Life and death come and go like marionettes dancing on a table. Once their strings are cut, they easily crumble. What we see now is like a dim image in a mirror. Then we shall see face to face. Very well thought out review! The first is the leader counters--while they have become a standard trope in tactical games, I think they distort how combat works at this level (all squads have inherent leadership that is much more relevant to how they perform), and they create unnecessary rules overhead. As for the order system, it's fun to use, but I think it doesn't accurately model how friction works on the battlefield at all. The chaos model is flat--a unit is just as unlikely to be able to move down a road on the first turn of the game as they are later on when they have become embroiled in a firefight. That doesn't jive with my reading on the subject. Instead, units should be fairly maneuverable before contact, but should be difficult to move once they are under fire, in part because they are totally absorbed with the threat to their front and are shooting back. It should be hard to get them to switch targets, but not to fire in the first place. That's not what happens in CC. Also, combat resolution is fairly binary, as units are either in good order or broken, with each state clearly defining how much control you have over the unit afterwards. I cannot speak for CoH because I played it only 3 or 4 times. As for CC, the assumption you make in your review is that CC doesn't portray exactly, to your experience, the mechanics of infantry fighting in WW2. I'd like to point out that the designer, as he states in his notes, created a game which was fun and then historical. The historical reconstruction was secondary to his intent. By comparing CC to its simulation value, of course the game will fall short. Here's my question, you don't imply this, but provided that Band of Brothers is a good simulation, and since you state that in the actual gameplay there are fewer decisions to be made, is it also a fun game to play compared with the other two titles you've discussed? "Band of Brothers goes in a different direction from CoH; instead of removing units via hidden rules, it floods the board with decoys." And this is what puts me off. I think any direct way of simulating FoW works best for computer games. In board games I prefer more abstract solutions. I don't want to have all the great counters obscured by tens of decoys littering the board. Other issue is the scope of the game. Combat Commander gives you tools for playing any theatre or conflict during WW2 period. I don't think it's true for Band of Brothers. Anyway, the game seems interesting enough to give it a try. You can't make a Statemented like that comparing a game that was released only this week with a game that was released 2006 and has 7 expansions in order to make it cover all the theaters. This is the first issue in a game series, and the next release "Band of Brothers: Ghost Panzer" and the Pacific version "Band of Brothers: The Old Breed" have already been announced as in development. Lets give Bob the same 5 years that Combat Commander has had before we compare the extent of the two systems. I think what you mean is that the VAT and the £10 flat rate "handling charge" for importing goods from the USA is prohibitive. I am getting stuff via Udo Grebe from Germany, it takes longer and you pay German sales tax but you don't get ripped off by the handling charge and he has a Preorder scheme. I seem to remember it being more than £10, I ordered half a dozen games in the GMT 50% facebook offer and by the time I had paid VAT and handling I had paid more than the full price. Awesome review. Thoughtful and informative. Very informative review; and I think you focused on exactly the right factors for a tactical simulation. I'd be interested to hear how folks compare Fighting Formations on these dimensions? Honestly, someone else would be more qualified to discuss Band of Heroes, as my experience with the game system is fairly limited despite owning the game. My experience is much more impressionistic, as when I tried to learn the system, I kept on asking myself why I wouldn't just play CC or CoH instead. Offhand, Band of Heroes also uses the leader mechanic for command purposes, which I didn't like. Gameplay is impulse based, though leaders allow you to have additional activations. 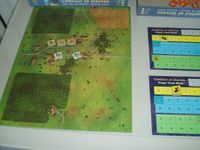 Most information is available on the board, so fog of war and C3I is handled through a spotting mechanic, whereby your troops may not see what you see until an enemy squad makes its presence known through movement or fire. The rule set isn't as clean, and throws in complications like multi-story buildings and infantry riding on vehicles, which feel like unnecessary complications in a game that is supposed to be streamlined. There is an extensive list of terrain, but no pictures on the terrain chart to show what is what, and I know I had several instances where I didn't know what terrain my units were in. I also didn't love the way fire resolution was handled and didn't agree with the way machine guns were used in particular (something I should have covered in my review of the other games, actually). Lastly, I noticed just from the demos and from my limited play that the board becomes something of a marker farm, which I don't have a high tolerance for. None of these things are necessarily crippling, but with two clean and elegant designs that I enjoyed playing, the various niggles I had with the Lock n' Load system added up to a general lack of enthusiasm for the system. But again, there are others with a lot more experience with BoH than me who could speak more authoritatively. Ditto. And nary a peep from my SS so I have to wait to pick this up (along with every other game on my wish list) until I know otherwise. Also, thanks Sean for the fantastic review. Sean, thank you for the in depth review. I purposely have not played the other systems (I get "designer guilt" if I study other systems in the same genre - almost as if I would be trying to steal their ideas), so I definitely appreciated the analysis. It summed up aspects of the systems at a designer level. You pretty much nailed my reasoning and thought process for the decisions in Band of Brothers. As for strategy, any game can offer strategy whether it is realistic or not. M44 and TOI don't pretend to be realistic. BoB does. I believe that BoB gives you the right feel and decision making for WW2 squad level tactical combat. I know that wargames tend to take a greater investment and have more rules overhead than other games. On that front I worked hard to make BoB easy to get into. It is probably of similar complexity to TOI - maybe slightly more complex - but it is in the same order of magnitude. Simply one of the most enjoyable reviews I've ever read on BGG. Thanks for the analysis. I found myself nodding in agreement on your assessments of CC and CoH (also my only two preferred WWII game systems at this point). I'm curious about the "less decisions but right decisions" aspect, but in any case, I'm quite sure I'll like this game. Now if I could only get my copy. Worthington said they shipped on the 11th but haven't received yet. The board is not flooded (with decoy/conceal markers) for long. Once units are engaged, begin firing at each other, and units begin to do things and reveal their positions, it will be more like a smattering. I wanted fog of war and uncertainty in the game, but I wanted it to be simple and I didn't want to have to write down unit locations on paper. This gives you a similar impact as more complicated systems - you won't necessarily even know where your opponents vehicles are at start and there is a benefit for being concealed - but the decoys are often removed very quickly and concealment becomes a situational thing.